Placitas Studio Tour May 11-12, 2019 Saturday & Sunday 10 a.m. - 5 p.m. I have spent my life in New Mexico, where I have studied photography and painting at UNM, Santa Fe Photographic Workshops and other venues. A photographer for 40 years, I initially specialized in B&W portraiture. In recent years, I have concentrated on botanical and landscape photography. 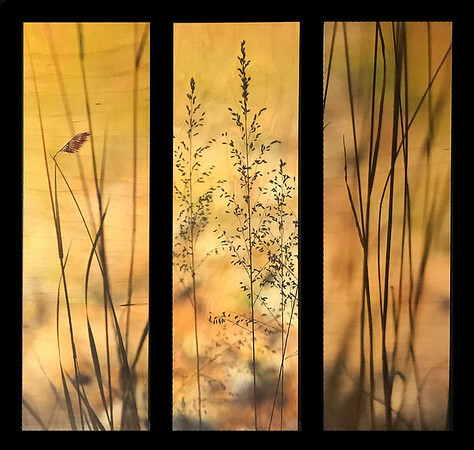 Much of my botanical work has been an in-depth study of grasses, both in nature and in studio, with some of these being printed on wood, allowing the grain of the wood to interact visually with the nature-based imagery. I group these wooden images together, "float" them on a background, and frame them; creating a three-dimensional shadow-box of botanical imagery, wood grain and ambient light. In my latest works, Variations on a Dream, Mysterious Trees, Water Dreamscapes, I'm using my camera and a slow shutter speed to "paint" dreamlike images of water, landscapes, trees and other subjects. These images are printed on dye-infused aluminum, which further emphasizes the painterly aspect and allows the images to, seemingly, glow from within.